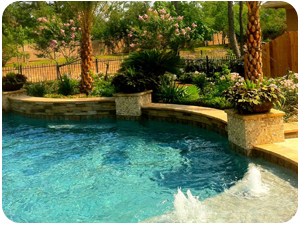 Since 1999, Envy Exteriors has been creating luxury outdoor living spaces in the Houston areas with custom landscaping, hardscaping and pool installation services. Envy Exteriors is truly a turn-key Landscape/ Pool Design + Build Company that takes you from your budget-managed design, through to a beautifully completed installation, with your peace of mind intact. We’ve found this to be our special ingredient that has helped us be so successful. We’re the designer, the contractor and the homeowner’s representative - all in one. Our job is to create a beautiful architectural design, manage your budget and help you mitigate the stress of the installation process so that you can focus on enjoying the fruits of your labor. We’ve taken the the vast complexity of Landscape, Hardscape and Pool Design and Installation and distilled it into a simple process. We take you from initial concepts, through a schematic design, planning, engineering and budgeting so that the project is thoroughly thought out prior to placing the first shovel in the ground. We give you the prediction and certainty on the project from the start. Our seasoned staff includes a Registered Landscape Architect, Custom Pool and Landscape Designers, Licensed Irrigators and Technicians, Masonry, Carpentry, Landscape and Pool Installation Specialists. We invite you to visit our showroom and landscape nursery to personally select all of your custom finishes - down to the plant! Experience matters. Make your investment in your outdoor living space one time. Attention to detail is the motto that is repeated throughout the work day at Envy Exteriors. Why Should I Consider Hardscaping?